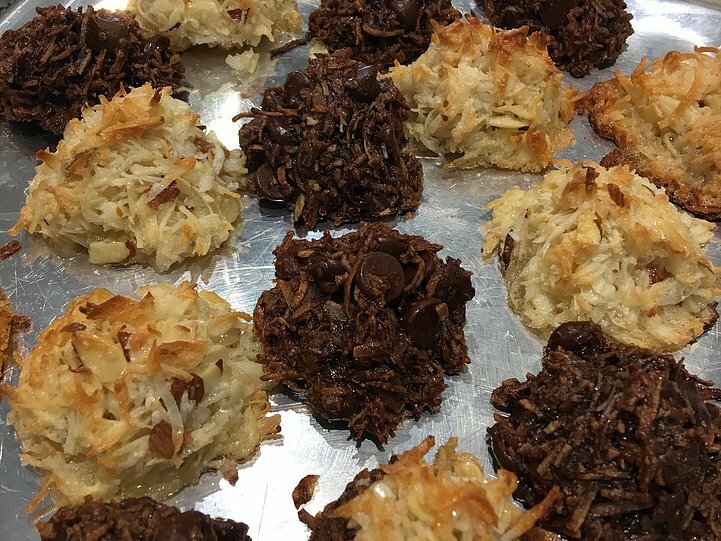 We made these for Passover, but they are delicious all year round! Friends were asking for the recipe, so here it is, with demonstration and all. While we were cooking we came up with some creative combos. Double Chocolate Almond Coconut (1/2 of each batter in one) and Double Chocolate macaroons topped with mini marshmallows. Making stuff up as you go is half the fun! In large bowl, whisk sugar with cocoa or almonds until combined. Stir in egg whites, salt, extract(s). Fold in coconut. If making Double Chocolate Macaroons, fold in chocolate chips too. Adjust oven rack to upper-middle position and lower-middle position and preheat oven to 350 deg. Line two baking sheets with parchment paper and lightly grease with cooking spray. Spoon a generous tbs of batter onto parchment paper for each cookie. Press gently and form into a mound. Continue with the rest of the batter spacing cookies 2" apart. Bake until set about 15 minutes. Remove from the oven and let cool on pan 10 minutes, and then transfer to a wire rack. Enjoy!